A waqf can be divided into two types which are waqf al-Khairi and waqf al-Dhurri. Public Waqf: A waqf that is made for the benefit of the public such as bridges, the mosques, cemeteries etc. This type of waqf comes under the direct control or supervision of the state. Quasi-Public Waqf: A waqf that is made for the benefit of a particular group or individuals such as scholars, students of religious knowledge etc. Waqf al-Dhurri is made for someone’s next of kin such as children, grandchildren and so on. However, it must be done for a religious, pious or charitable purpose. This type of waqf is made to fulfil the duty of every Muslim to secure the well-being of those who fall under their responsibility. The beneficiaries cannot gain ownership of the waqf asset but are only entitled to benefit from it. 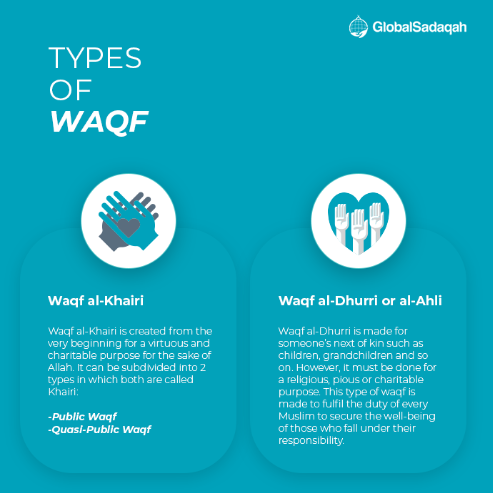 The ultimate benefit, however, has to be reserved for the permanent religious, pious or charitable purposes and such purposes have to be clearly specified or implied in the waqf deed. Besides that, if a waqf is created in favour of its beneficiaries and their generations to come, but their shares are not specified, then every one of the beneficiaries – regardless of gender – are entitled to equal share of the waqf asset’s income. Appoint, remove, and control a mutawalli (administrator of a waqf asset) during his/her lifetime. Entitled to specify the manner, the conditions and the period, for which a person or a group of persons appointed as a mutawalli in the waqf deed. Specify a person or a group of persons who shall be entitled to appoint a mutawalli. The power to designate a successor to the mutawalli. Otherwise, a mutawalli would be appointed by a qadhi (judge). It is also possible to have a committee entrusted with the administration of the waqf. May authorise the mutawalli and his successors to take a fixed remuneration out of the income from the waqf asset. If there is no remuneration fixed in the waqf deed, the court may, on the application of the mutawalli, authorises the mutawalli to realise a remuneration from the income of the waqf asset. Mutawalli refers to a manager or custodian of a waqf asset who is responsible for its administration. A mutawalli does not own the waqf asset but bears a serious responsibility before Allah, the founder (waqif) and the beneficiaries if something goes wrong because of his/her carelessness or irresponsibility. A mutawalli may be appointed either by the waqif during their lifetime, through the waqif’s al-wasiyyah (Will) or by a qadhi (Judge). The waqif must specify a specific person/entity or define his/their qualities to be a Mutawalli. If he or she does not define or specify, then the Qadhi must be appointed to appoint a mutawalli. Besides that, if the Waqif defined rules like the mutawalli will be among this family or this quality, then it has to be maintained. Else, the Qadhi will decide who will be the mutawalli or his successor. Also, a mutawalli may also appoint another person as a mutawalli and the waqif should permit this in the waqf wasiyyah. Besides that, waqf is considered a legal entity (a body with full rights and responsibilities according to the law). It is represented by the mutawalli both as a plaintiff and as a defendant. The duty is to do everything necessary and proper to protect and manage the waqf asset in favour of the beneficiaries. Thus, a mutawalli is considered as an assistant to the waqif and is responsible for the distribution of the waqf proceeds amongst the beneficiaries and he/she can give up the status of mutawalli of a waqf asset without the permission from a judge (qadhi). Sell, mortgage or change the ownership of waqf assets. Transfer his duties, functions and powers to another person and make him the trustee. Borrow money for spending on beneficiaries. On the other hand, the court may remove the mutawalli of a waqf asset if he/she is found negligent, careless or irresponsible. When it comes to maintenance, a Mutawalli is not allowed to take a loan for the renovation of the waqf asset except with the permission of the court. The loan should be paid from the net income of the waqf. However, a mutawalli may suggest a better business plan. For example, if an agricultural land is made waqf and later it is found that the land can generate more income if houses are built, then, with the permission of the court and the approval of the beneficiaries, the mutawalli has the right to build houses over the same land, and raise money for its construction. But, it must be noted that neither the mutawalli nor his/her relatives are allowed to rent the houses unless if the court approves. As for the beneficiaries, they cannot interfere with the waqf business and maintenance such as rent collection as it is solely done by the mutawalli. The right of the beneficiaries is from the waqf’s net income after defraying all the necessary expenses including zakat and repairs of the building. Moreover, revenue earned from a waqf asset may be used to buy other assets. However, these other assets are not considered as waqf asset and may be sold when the need arises to meet other expenses of the waqf. Furthermore, since it is the duty of a mutawalli to keep a waqf asset in good condition, if any necessary renovation incurs debt, a mutawalli may borrow money with a court or other reliable authorities’ permission. The debt shall be paid from the income of the waqf asset. Moreover, a mutawalli has the right to rent out a waqf’s shops, gardens, houses, or other estates or to cultivate the waqf lands and other income-generating streams in accordance with the conditions laid down by the waqif. If there is an accumulation of excess income from a waqf asset after all the costs have been deducted, a mutawalli shall has the right to spend it on similar matters of general welfare such as for the welfare of a group of other poor people. Is Waqf Mentioned in the Quran?